Creating content using low competition keywords has a great value because it’s quite easier to rank with low competition keywords than high competition ones. So, it’s important to learn how to find low competition keywords. Note that you can find low competition keywords manually or you can do it using tools. The manual process takes much time whereas a decent keyword research tool can save a lot of your valuable time. So, I recommend you use a good tool for finding out low competition keywords. And SEMrush is a nice tool that you can use to find low competitive keywords (read: how SEMrush helped me to make my first $40!). In this blog post, I’ll show you how to use SEMrush to find these types of keywords. First of all, visit SEMrush (Click Here). You’ll land the homepage of the keyword research tool. If you don’t have an account of SEMrush, you should create one for free. On the homepage of SEMrush, you’ll see a search box for researching keywords and domains. Since you need to find low-competitive keywords, you’ll have to drop your desired keyword (not domain) in the search box. After putting your desired keyword in the search box now is the time to click on the Search button seen on the right side of the box. Note that the above screenshot of SEMrush search box was taken some months back. Now, the Start now button has been replaced with Search. Suppose that you need to find low-competitive keywords related to affiliate marketing. So, drop affiliate marketing in the search box and then, hit the Search button. It’ll bring two groups of keywords (one is PHRASE MATCH KEYWORDS and the other one is RELATED KEYWORDS) related to the given keyword. Under each of the groups, you’ll see View full report button. Click on it and it’ll show a longer list of phrase match/related (according to which group of the keyword you select) keywords. So, you can see that there are two different sections (Volume and KD) for each of the keywords. The volume section indicates the monthly search volume of a specific keyword whereas the KD of a keyword means its keyword difficulty. K for Keyword and D for Difficulty, so KD means keyword difficulty. SEMrush shows the keyword difficulty of a keyword in percentage. And the keyword difficulty or the KD of a keyword is related to its competition. The more the KD of a keyword, the higher the competition of that keyword. Similarly, if the KD of a keyword is low, then it can be considered as a low competition keyword. Therefore, the keyword, affiliate marketing, is a high-competitive keyword because its KD is 80.49. 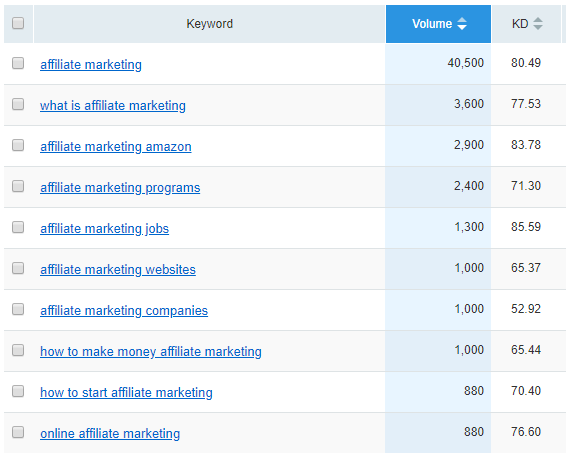 On the other hand, the keyword, affiliate marketing companies, is a low-competitive keyword because its KD is only 52.92. I select those keywords that have a KD of 50 or 60. Any KD above 70 indicates very competitiveness. SEMrush considers different characteristics of a keyword at the time of showing its KD and it has a solid foundation. Now, you can select all of your preferable low-competitive keywords because the KD of the keywords are found on the right-hand side of every keyword. After searching a keyword using SEMrush, your only task is to check the KD of them. By analyzing the KD of a keyword, you can tell whether it’s a low-competitive one or not. So, this is marvelously an easier way to find low competition keywords. How I increase 72.84% organic traffic using LSI keywords? How to use Google AdWords Keyword Planner? Some things to consider while targeting keywords! Finally, I can say that if you use SEMrush, then you can save your time and utilize that time in other online marketing hacks. You can argue with me that a free keyword research tool like Google AdWords Keyword Planner can also help us find nice keywords, but note that it can’t directly tell us which keywords are low-competitive. If we need to find out the competition for a keyword using Google Keyword Planner, we still need to do a lot of tasks in order to do so. So, SEMrush premium is worth it because we can find a keyword’s competition level just beside it. I think if we use low competition keywords we get low traffic. Is it right ? No, using low-competitive keywords doesn’t mean that you’ll get less traffic. In fact, you should get more traffic if you use low competition ones because it’s very likely to rank high with low-competitive keywords.